The winemaker at Pear Valley Winery must be a big fan of peppery wine, and his bottles of wine showcase the peppery dry side of Paso Robles. If you’re looking for spice and pepper, make sure this is a stop on your wine journey through the Gold Coast of California. You’ll find this winery at 4900 Union Road south off Highway 46 E. It’s located on top of the hills looking west over the Paso Robles highlands. On top of another hill overlooking the winery is a nice venue for weddings and events. It’s a very large wine tasting room separate from their production facility. 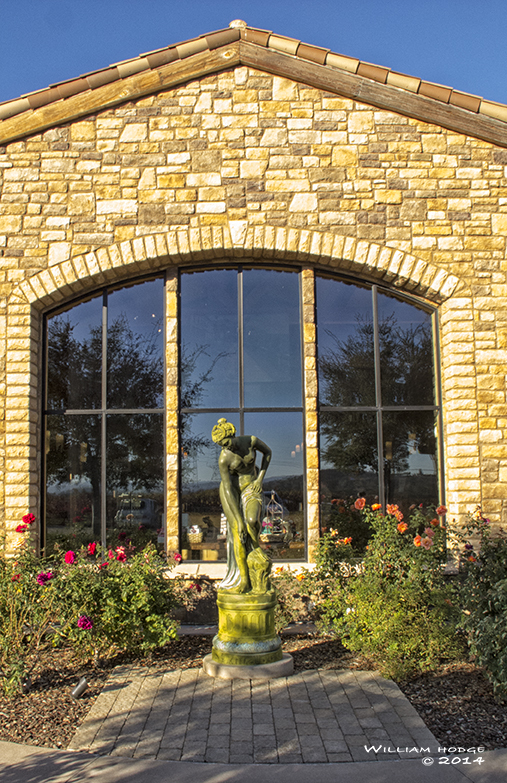 It’s what we would call an edifice wine tasting room with 5,000 square feet of tasting room, It was completed in 2009 by owners Tom & Kathleen Mass with lots of statues, stone, hedges and benches. It’s a picturesque place to enjoy a picnic lunch on the highlands overlooking vistas of Paso Robles. And here we would like to digress a bit, and talk about how wineries pour their wine. These wines were peppery and bold even though they were using Hailey’s Corker on their bottles of wine. Which means, without them, the wine would be even more peppery and bold. And we’d like to share this because there were many times in our early journeys through California wine country, buying wine we enjoyed, we would come home and pop a cork only to find the wine wasn’t quite what we remembered. As we explored more and more of California bottles of wine we noticed the use of aerators and the impact they have on the taste of wine. Today, we keep several aerators on hand and will test a bottle of wine without the aerators and with the aerators before deciding which way to pour. Devices like Haley’s Corker, or the Menu Decanting Pourer and others are designed to soften the wine and make them more pleasing to less tolerant palates. We’ve noticed these devices throughout Paso Robles, throughout the state. And we think any winery pouring wine through an aerator should encourage you to pour your purchases the same way. 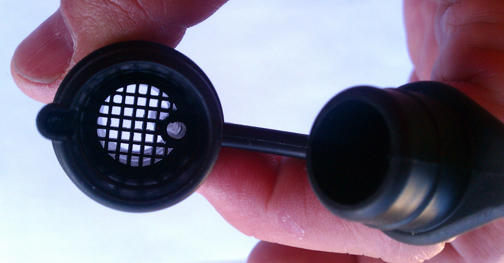 If you’re purchasing bottles of wine from them, they should clarify that you should be pouring their wine with aerators. This way, you’ll have the same experience at home tasting their wine as you enjoyed at the winery. But, alas, many of these wineries don’t even sell the aerators they use, much less advise you to use the same device at home when you’re sharing with friends. We think this is unfortunate and should be corrected. If a winemaker is using an aerator to pour wines in their tasting room, they should encourage buyers to include an aerator in their purchase. They might even throw in an aerator with the purchase, to ensure a happy customer who will speak well of the wine. This entry was posted in California Wineries - New World Wines, GSM, Highway 46 Corridor, Merlot, Paso Robles AVA, Petit Sirah, The Pleasures of Tasting Wine, Thoughts About Wine - Exploding Ruby Flowers On Your Palette and tagged bottle, bottle of wine, california, paso robles, wine tasting room, wineries.